Potentiometric surface map for the Utah FORGE site. Groundwater elevation is highest west of the Mineral Mountains where the basin fill aquifer receives recharge. Groundwater elevation decreases to west towards areas of discharge near the Beaver River channel. Stefan Kirby joined the UGS in 2004 and is a Senior Geologist in the Groundwater Program. 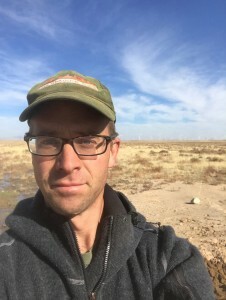 He has worked on a wide range of projects that include basin-scale groundwater studies, geologic mapping, oil and gas produced water, and various aspects of geothermal investigations. The Utah Frontier Observatory for Research in Geothermal Energy (FORGE) project is a U.S. Department of Energy-funded geothermal energy research project aimed to design and test new techniques for stimulation and development of geothermal resources in hot crystalline rocks (see Survey Notes, v. 48, no. 3). These types of rocks (which include granite and various types of metamorphic rock) contain vast amounts of heat at depth throughout Utah and the U.S. Making use of this heat, for power generation or direct heating, has proven difficult because these rocks generally do not produce useable quantities of water to wells. The FORGE project aims to exploit these hot rocks by stimulating (fracturing) them and improving their ability to yield water to wells. For Utah, and particularly Beaver and Millard Counties, the FORGE project is an opportunity to tap into vast new energy and economic resources stored as heat in the earth’s crust. The Utah Geological Survey is an important part of the FORGE project team, and work thus far has included characterization of the groundwater near the Utah FORGE site. The Utah FORGE site is in Utah’s arid west desert, eight miles northeast of Milford, near the Beaver-Millard County line. Groundwater in this part of Utah is the primary source for agriculture and drinking water. The FORGE project will also use this groundwater for various phases of drilling, completion, stimulation, and circulation testing. Because the groundwater is important to the local community and agricultural economy and as a supply for the FORGE project, understanding the conditions and chemistry of the groundwater is imperative. The FORGE project area lies just west of the Mineral Mountains and the Roosevelt Hot Springs geothermal area. The Mineral Mountains are primarily Tertiary-age granitic intrusive rocks, Precambrian-age metamorphic rocks, and Quaternary-age volcanic rocks. Along the western margin of the range, the granitic rocks intrude the metamorphic rocks. The volcanic rocks occur west of the crest of the Mineral Mountains. Unconsolidated basin fill covers the remainder of the study area and consists of alluvial, lacustrine, and fluvial deposits. Shallow groundwater in the study area resides in an unconsolidated basin-fill aquifer that blankets older rock units including the crystalline basement rocks that host the FORGE reservoir. Based on well logs, unconsolidated basin fill exists in both unconfined and confined conditions in the study area. Unconfined conditions generally exist across the broad alluvial fans that slope westward from the Mineral Mountains. Farther west along the valley floor, the unconsolidated basin fill includes thick layers of clay, which are just over 100 feet thick and may be laterally extensive along the valley axis. The total thickness of the unconsolidated basin-fill aquifer varies from more than 500 feet west of the Roosevelt Hot Springs hydrothermal system to 100 to 600 feet thick along the valley floor. Groundwater generally moves from areas of recharge along the flanks of the Mineral Mountains to areas of discharge along the valley floor. Groundwater elevations decrease to the west away from the Mineral Mountains. Just west of the Opal Mound fault and Mineral Mountains, the potentiometric surface (or groundwater elevations) dips steeply westward and then flattens out towards the center of the valley. The depth to groundwater in the unconsolidated aquifer varies sharply across the study area, decreasing west from the Opal Mound fault. Beneath the FORGE deep drill site, the groundwater elevation is approximately 5100 feet and the depth to water is between 500 and 600 feet. Groundwater chemistry provides basic information for groundwater quality and fluid flow through the shallow basin-fill aquifer. In the study area, groundwater chemistry indicates both calcium-bicarbonate to sodium-chloride water types. Samples of geothermal fluids from Roosevelt Hot Springs and geothermal production wells at the Blundell power plant are sodium-chloride water type. Nearly all samples, downgradient and to the west of these geothermal samples, share this sodium-chloride chemistry. Two samples from springs in the Mineral Mountains, upgradient of the geothermal samples, are calcium-bicarbonate type, representing non-thermal water. Other calcium-bicarbonate samples are located north of the project area near Antelope Springs and to the south near Milford. A plume of thermal water having high total dissolved solids (TDS) concentration emanates from the north end of the Opal Mound fault and Roosevelt Hot Springs. This plume broadly defines the area of thermal outflow in which TDS concentrations decrease to the west, north, and south as the plume disperses in the unconsolidated basin-fill aquifer across the FORGE deep drill site. The ratio of chloride to boron (Cl/B) in groundwater beneath the FORGE site, which is uniformly ~100, also indicates the water originates from the active geothermal system at Roosevelt Hot Springs. As TDS decreases due to dilution from east to west, the groundwater Cl/B value remains consistent. The Cl/B ratio rises to 200–700 on the periphery of the outflow plume as the geothermal outflow mixes with cool basinal groundwater. TDS in groundwater beneath and adjoining the FORGE site ranges from 4000 to 6000 mg/L, exceeding the U.S. Environmental Protection Agency’s primary and secondary drinking water standard. Therefore, potential use of groundwater in this area for drinking water and agriculture is limited. However, the groundwater is suitable and accessible for use in the FORGE project, and this use will have little impact on agricultural and drinking water used in the valley around Milford.